My thesis project consists in the search for brown dwarfs and low-mass stars (spectral types > M5) members of moving groups in the solar neighborhood. Moving groups are relatively young (10 to 150 Myr) ensembles of stars. They formed together from the same molecular cloud, and their several million years of age was sufficient to get rid of interstellar dust remaining from early stages of formation, as well as for star members to slowly start dispersing in the Milky Way. However, even if they started dispersing we can still notice that they belong to a given moving group because they still have similar galactic velocities (hence the name “moving group”). Since these moving groups are located close to the Sun (closer than approximately 400 light years, which is called the “Solar neighborhood”), they can be found almost everywhere on the Celestial sphere. For these reasons, only massive and bright members have already been identified for the most part. Extensive efforts have recently been made to identify lower mass members to these moving groups (mainly spectral types ~K0 to M5) by a number of different teams, including Lison Malo. In order to be able to identify a large quantity of new candidate members to those moving groups without needing to measure their distance or radial velocity first, our team developed a statistical tool named BANYAN, which is based on Bayesian inference. My principal contribution is to continue developing this tool (see BANYAN II) as well as adapting it and using it for the search of candidate members with even lower masses, covering the regime of brown dwarfs, and even planetary masses. I start from a cross-match the near-infrared (NIR) catalogues 2MASS and WISE which is input to BANYAN II to identify a set of credible candidates. I then perform a NIR spectroscopic follow-up to identify signs of youth and hopefully corroborate the membership hypothesis. Many fundamental reasons lead us to search for such objects. First, they would allow us to understand their population statistics through their initial mass function (IMF; the population histogram as a function of mass). Many questions are still open concerning this IMF; for example, we don’t know well how it depends upon environment. It will also provide us with precious informations on the physical processes at play during the formation of low-mass stars and brown dwarfs. A second benefit will be to help us understanding the atmospheres of gaseous giant exoplanets, particularly difficult to study because of their host stars, typically very close and many times brighter, hence blinding our instruments. Effectively, the atmospheres of young and very low-mass brown dwarfs display a dazzling resemblance with those of the few giant planets for which we were yet able to study the atmosphere. This brings us to the second interest of this project : searching for potential subtle differences between the atmospheres of planetary-mass brown dwarfs, and those of exoplanets. The question of where to draw the line between calling low-mass, isolated objects “brown dwarfs” or “planets” is still blurry, and still yields heated debates within researchers. The International Astronomical Union (IAU) has adopted the definition that the limit between these two types of objects is at 13 times the mass of Jupiter, below which we believe a stellar object would never do the nuclear fusion of deuterium in its core. However, this does not take account of the fact that objects below 13 Jupiter masses can most probably form and behave like brown dwarfs. Furthermore, it is expected that some gaseous planets will get ejected from young stellar systems because of dynamical interactions. This would give rise to a population of freely floating exoplanets, with properties very similar to those of low-mass brown dwarfs. Identifying subtle differences in the atmospheres of exoplanets and brown dwarfs could thus allow us to differentiate between such low-mass brown dwarfs and freely-floating planets. Finally, another crucial purpose of this project is to build up a compelling target list for the search of exoplanets by the method of direct imaging. The contrast between low-mass stars and young planets will be lower than that of typical systems, which will facilitate these types of detections, as well as their follow-up study. The near-infrared spectrum of the planetary-mass brown dwarf J1207-3900. It displays characteristics very similar to other young brown dwarfs (blue and yellow lines). In contrast to this, old brown dwarfs of the same temperature (red line) show several differences, such as the shape of the continuum between 1.5 and 1.6 microns. The identification of new candidate members to moving groups from the set of already known young brown dwarfs (Gagné et al. 2014a. The discovery of the two coldest and lowest-mass brown dwarfs in the TW Hydrae association (Gagné et al. 2014b) – the coldest one having an estimated mass of 12 Jupiter masses. The discovery of the candidate free-floating planet CFBDSIR2149 (Delorme et al., 2012), with an estimated mass between 4 and 7 Jupiter masses. The discovery of a 11 – 12 Jupiter mass companion to a binary low-mass star, candidate member to a moving group (Delorme et al., 2013; Gagné et al., in preparation). The discovery of dozens of new young brown dwarfs, including a few with estimated masses as low as 10 times that of Jupiter. (Gagné et al., in preparation). The discovery of a 13 Jupiter mass companion to a low-mass star (Artigau et al., in preparation). The discovery of several hundreds of new brown dwarf candidate members to moving groups (Gagné et al., in preparation). The discovery of the coldest brown dwarf candidate member to the Argus moving group (Gagné et al., in preparation). Trajectories of new candidate brown dwarfs discovered in this project (dark purple lines). We have already done a spectroscopic confirmation of youth for a fraction of those (magenta lines). It can be seen that the trajectories of the new candidates are consistent with those of already known members (green lines). Another aspect of my thesis project is the use of near-infrared radial velocity measurements to detect exoplanets around low-mass stars. We use the CSHELL instrument at IRTF to aim at tight-orbit gaseous exoplanets with masses between those of Neptune and Jupiter. I am involved in this project led by Peter Plavchan at the Infrared Processing and Data Analysis Center (IPAC; Caltech) as part of a 6-months IPAC fellowship. Artigau, É.; Lafrenière, D.; Doyon, R.; Liu, M.; Dupuy, Trent; Albert, L.; Gagné, J.; Malo, L.; Gratadour, D.; Discovery of Two L and T Binaries with Wide Separations and Peculiar Photometric Properties; 2011; ApJ, 739, 48-61. arxiv:1107.0768. Delorme, P.; Gagné, J.; Malo, L.; Reylé, C.; Artigau, É.; Albert, L.; Forveille, T.; Delfosse, X.; Allard, F.; Homeier, D.; CFBDSIR2149-0403: A 4-7 Jupiter-Mass Free-Floating Planet in the Young Moving Group AB Doradus ? ; 2012; A&A, 548A, 26D. arxiv:1210.0305. Malo, L.; Doyon, R.; Lafrenière, D.; Artigau, É.; Gagné, J.; Baron, F.; Riedel, A.; [BANYAN. I.] Bayesian Analysis to Identify New Star Candidates in Nearby Young Stellar Kinematic Groups; 2013; ApJ, 762, 88M. arxiv:1209.2077. Delorme, P.; Gagné, J.; Girard, J. H.; Lagrange, A. M.; Chauvin, G.; Naud, M. È.; Lafrenière, D.; Doyon, R.; Riedel, A.; Bonnefoy, M.; Malo, L.; Direct-Imaging Discovery of a 12-14 Jupiter-Mass Object Orbiting A Young Binary System of Very Low-Mass Stars; 2013; A&A, 553L, 5D. arxiv:1303.4525. Naud, M. È.; Artigau, É.; Malo, L.; Albert, L.; Doyon, R.; Lafrenière, D.; Gagné, J.; Saumon, D.; Morley, C.; Allard, F.; Homeier, D.; Boucher, A.; Discovery of a Wide Planetary-Mass Companion to the Young M3 Star Gu Psc; 2014; ApJ, 787, 5. Maire, J. ; Gagné, J. ; Lafrenière, D. ; Doyon, R. ; Graham, J. R. ; Véran, J. P. ; Poyneer, L. A. ; Preserving the Photometric Integrity of Companions in High-Contrast Imaging Observations Using Locally Optimized Combination of Images; 2012 ; Proc. SPIE 8447, Adaptive Optics Systems III, 844760 D. 2012. Naud, M. È. ; Artigau, É. ; Doyon, R. ; Malo, L. ; Albert, L. ; Lafrenière, D. ; Gagné, J. A Wide Planetary-Mass Companion to a Young M3 Star of the AB Dor Moving Group; 2013; EPJ Web of Conferences; 2013EPJWC..4713004N. Delorme, P. ; Gagné, J. ; Lannier, J. ; Lagrange, A. M. ; Chauvin, G.; Brown Dwarfs or Planets ? Some Direct Imaging Detections that Blur the Border; 2013; Mem. S. A. It. Vol. 84, 1013. Gagné, J. ; Lafrenière, D. ; Doyon, R. ; Malo, L. ; Faherty, J. ; Artigau, É. ; Bayesian Analysis to Identify Very Low-Mass Members of Nearby Young Stellar Kinematic Groups; 2013; Mem. S. A. It. Vol. 84, 916. arxiv:1307.1127. Contributed Talk – UdeM – Montreal, Qc, CA – 2014. Weekly Conferences (Astro-Pizza). The method of spectro-astrometry to exact barely resolved binary traces (French). Oral Presentation as part of a poster pop-up presentation – Barcelona, Spain – 2012. Cool Stars 17 symposium. The search for brown dwarfs in young moving groups. Contributed Talk – Sainte-Adèle, Qc, CA – 2011. Centre de Recherche en Astrophysique du Québec (CRAQ) yearly symposium. Direct imaging of exoplanets with the LOCI algorithm. Contributed Talk – UdeM – Montreal, Qc, CA – 2009. Summer internship weekly conferences. The SIMP survey and the Observatoire du Mont-Mégantic telescope. (French). Flagstaff, Arizona – 2014 (planned). Cool Stars 18 Symposium. The search for brown dwarfs in young moving groups. Barcelone, Spain – 2012. Symposium Cool Stars 17. The search for brown dwarfs in young moving groups. Guide for developing an iOS application – Astrobetter – Link. The iOS application Brown Dwarf Converter – Astrobetter – Link. 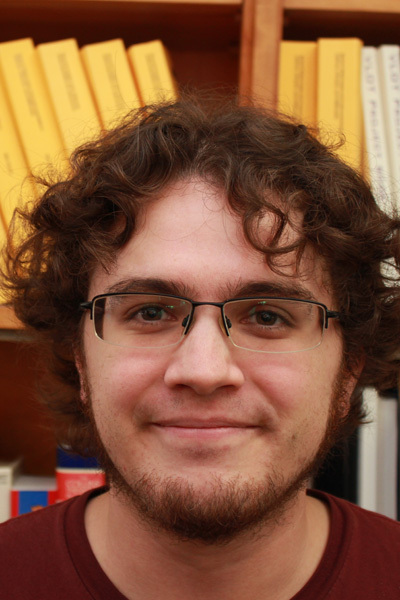 2010 – 2015 (Ongoing) – PhD in Astrophysics at Université de Montréal. Search for low-mass stars and brown dwarf candidate members to nearby, young moving groups. 2007 – 2010 – Bacc. Physics, Université de Montréal. Faculty Lecturer – UdeM – Fall 2013. PHY1950 – Notions of Physics for Teachers (French). Faculty Lecturer – UdeM – Fall 2012. PHY1652 – Special Relativity (French). Faculty Lecturer – UdeM – Fall 2011. PHY1652 – Special Relativity (French). Teaching Assistant – UdeM – Winter 2010. PHY1620 – Waves and Vibrations (French). Teaching Assistant – UdeM – Fall 2009. PHY1652 – Special Relativity (French). Teaching Assistant – UdeM – Fall 2008. PHY1651 – Classical Mechanics (French). Cool Stars 18 – Flagstaff, Arizona, US – Summer 2014 (plannet). Brown Dwarfs Come of Age – Flagstaff, Arizona, US – Summer 2013. CRAQ workshop – Sainte-Catherine-de-la-Jacques-Cartier, Qc, CA – Summer 2013. Cool Stars 17 – Barcelone, Spain – Summer 2012. CRAQ Symposium – Saint-Alexis-des-Monts, Qc, CA – Summer 2012. JAREPUM – Montreal, Qc, CA – Winter 2012. Mid-Term Symposium for the SPIROU camera – Montreal, Qc, CA – Winter 2012. Evry-Schatzman Summer School – Roscoff, France – Summer 2011. CRAQ student workshop – Montreal, Qc, CA – Summer 2011. Rencontre du CRAQ – Sainte-Adèle, Qc, CA – Summer 2011. JAREPUM – Montreal, Qc, CA – Winter 2011. Cool Stars 16 – Seattle, Washington, US – Summer 2010. February – July 2014 – 22 nights – Observations with the CSHELL spectrograph at the IRTF telescope in classical and remote mode. Technical servicing of the gas cell motor control computer. January 2014 – 1 night – Training for the use of the near-infrared imager NIRC2 on-site at VLT observing headquarters, Hawaii. February – March 2013 – 12 nights – Commissioning of the SIMON camera at the CTIO 1.5m telescope, Chile. Technical support for hardware and software, as well as scientific astronomical observations for queue mode data. 2013 – 6 nights – Classical mode observing with the OSIRIS spectrograph at the SOAR telescope, Chile. 2012 – 2014 – ~20 nights – Classical and remove observations with the SpeX spectrometer at the IRTF telescope, Hawaii. 2012 – 2014 – 270 hours – Queue observing preparation (Phase II) as principal investigator for GMOS-S and Flamingos-II at Gemini-South (Chile), GMOS-N and GNIRS at Gemini-North (Hawaii), as well as CRIRES at the VLT (Hawaii). 2008 – 2012 – 82 nights – Classical mode observing with the SIMON and CPAPIR cameras at the Observatoire du Mont-Mégantic telescope. Philippe Delorme – IPAG – Grenoble, France – Web Page. Jacqueline K. Faherty – Universidad de Chile – Cerro Calan, Chile – Web page. Kelle Cruz – AMNH – New-York, US – Web Page. Peter Plavchan – IPAC – Californie, US – Web Page. Jacqueline Radigan – University of Toronto – Toronto, Canada – Web Page. Adric Riedel – AMNH – New-York, US – Web Page. David Rodriguez – Universidad de Chile – Las Condes, Santiago, Chile – Web Page. Joshua Schlieder – Max Planck Insitute for Astronomy – Heidelberg, Germany – Web Page. David Blank – AMNH – New-York, US. Jérôme Maire – Dunlap Institute – Toronto, Canada – Web Page. Céline Reylé – Observatoire de Besançon – France – Web Page. France Allard – CRAS – Lyon, France – Page Web. Observatoire du Mont-Mégantic Astronomical Calendar. Data reduction and astronomical observing for the OPIOMM calendars, distributed throughout Québec (2013, 2012, 2011 and 2010). Artistic Creations of Jean-Pierre Aubé. Several meetings with the Montreal artist Jean-Pierre Aubé for scientific popularization, as part of his artistic creations based on scientific data. Link to his exhibition Exoplanètes. Scientifique popularization at the Observatoire du Mont-Mégantic. Oral presentations to the general public for OMM visitors (typically 20 persons). Popularization of low-mass stars, exoplanets, brown dwarfs and near-infrared cameras (2009 and 2011). Gagné et al. 2014a ; BANYAN II and known, young brown dwarfs – Link. Gagné et al. 2014b ; The discovery of a L1-type brown dwarf in TW Hydrae – Link. The BANYAN II web tool – Link. The Montreal Spectral Library – Link. To estimate the mass of a low-mass star or brown dwarf, using 2MASS / WISE photometry, age and distance – Link. To use the API web service of Astrometry.net – Link. To use a local implementation of Astrometry.net with IDL – Link. To perform web queries to the SIMBAD service – Link. To combine measurements with individual errors – Link. To compute XYZ and UVW Galactic coordinates with error propagation – Link. To fit scatter data points with a 3D ellipsoid free to rotate around three Euler angles – Link. To perform a 3D rotation on cartesian coordinates with error propagation – Link. To transform Euler angles into rotation matrices, and vice-versa – Link. An example IDL routine to generate a figure for spectral comparison (Figure 1, Gagné et al. 2014b) – Link. A list of current members to nearby, young moving groups (as of december 2013) – Link. A list of known young field brown dwarfs (as of december 2013) – Link. An iOS application to convert the mass / temperature / spectral type / etc. for brown dwarfs – Link. User manual for the Astrometry.net service – Link. User manual for the SIMON spectrograph and imager at the CTIO-1.5m – Link. The Bible of Physics (French) – Link. About the problematic membership of Kappa Andromeda to the Columba association – Link. The brown dwarf (and M dwarfs) archive – Link. The AstroBetter blog maintained by Kelle Cruz – Link. The BDNYC blog, maintained by the BDNYC research group at AMNH (Anglais) – Link. The IRSA service to create Finder Charts and perform 2MASS and WISE queries – Link. The Wolfram Alpha service, to (amongst others) stop worrying about physical units when do physics – Link. The astronomical applications developed by Cédric Foellmi – Link. The ADS service for the query of scientific papers – Link. The arXiv service for the query of scientific papers – Link.